Alright fight fans, boy do we have a doozy for you this week! The heavyweight Snickers ice cream bar takes on a featherweight challenger. Sure, you may not have faith in Weight Watchers, but after a few sparring matches earlier in the week, I knew this one would be a surprisingly worthy match up. In the brown corner, we have the oversized Snickers Ice Cream Bar, the kind you might find in a convenience store. While a regular ic bar clocks in around 50g, this heavyweight tries to really satisfy with a might 83 gram serving. I have been a fan of these since high school. It's just so hard to beat "creamy ice cream topped with chewy caramel and fresh roasted peanuts and then covered in rich delicious chocolate" (paraphased). Cost: $1.21. In the white corner, we have a treat that I've walked by many times and finally decided to pick up. I don't know why I waited so long. It looks like a snickers (well, the box does) and it sounds like one too - "Peanut Butter low fat ice cream topped with caramel and peanuts covered in milk chocolate flavored coating". Well, it sure sounds like the low fat version anyway. WW only weights 44g, so that's just over half of what the Snickers weighs. A box of 6 costs $3.98, but since 2 of these equals 1 snickers, we're talking $1.36 for an equivalent serving. Well, the Snickers bar is working the whole candy bar vibe, but let's be honest, we're staring at two chocolate bars and visually - I'd be willing to settle for either one of these in a pinch. It's kinda weird to see the WW peanuts so exposed, and they don't exactly run the whole length of the bar, but it still has potential. The Snickers bar is more mysterious and really works the whole candy coated allure you find in a typical candy bar. (the bars are side by side, I've just removed the plate so you can see them better). Verdict: Gotta give it to Snickers, but WW is definitely doing ok for itself so far. Ok, here's a side by side comparison from well, the side. The Snickers didn't survive the cut open very well. It's shell is just a bit thinner and has a different consistency that just doesn't hold together well. Also notice the abundance of peanuts just waiting to escape out of their caramel home. We definitely have two different caramels running here. The weight watchers caramel is less abundant and a bit more solid while the snickers caramel is ooey, gooey, and bursting forth. Now, let's look closely at the ice cream. 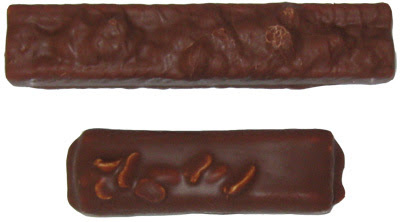 Snickers gives us a nice light brown colored peanut butter ice cream that looks kinda like the inside of a 3 Musketeers bar. Weight Watchers gives us a very white ice cream with a much more ...condensed? ...look to it. If you look real real close, you can actually see the WW ice cream melting just a smidge in the bottom left corner. While a real ice cream melts into a milkshake like substance, I've discovered that light ice cream can actually start melting into what looks like a puddle of water. Thankfully neither of these should be left out long enough to be bothered by what happens when they melt. Verdict: Again WW does alright, but you can't beat a Snickers! Round 3: Time for Tasting! Finally!! I love Snickers, I really do. It has been my favorite candy bar for as long as I can remember, and I've loved Snickers Ice Cream bars since my buddy discovered them in High School. They are just so good. You take an excellent snickers, and then you make it even better by making it an ice cream. I can remember eating one, savoring it, then racing to the fridge for a second (before someone else did). Oh yeah, we ran up the ice cream bill big time with these awesome treats. ...Maybe I should buy him a few big boxes to make up for all those lost treats. I don't expect much from Weight Watchers, I really don't. It's gotta be hard to make something pretend to taste good while still staying within the confines of a "diet". However, this is a frozen treat blog, and to be fair, I decided to give these a try, and guess what? They ain't bad, they ain't bad at all. I set the bar pretty low going in and WW had no problem clearing it. It's a decent treat, it really is. No, the ice cream isn't really ice cream (in my mind), but the shell is decent, the caramel strip is decent, and it all comes together better than I expected. It's cold, it's got a decent peanut butter vibe, and there's no strikingly funny tastes or after tastes messing with me. Good job Weight Watchers. You put up an excellent fight, and with your nutritional credentials, you are a worthy choice for the dieter jonesin' for a Snickers bar. Sure, you can't beat the best, no one can, but I have no problem recommending you!